Fossum pictured before filming of "Kicking and Screaming." Having endured almost a month trekking it in the jungles of Fiji on Fox’s survivalist reality show “Kicking and Screaming,” McAllen native Terry Fossum proved victorious and took home the grand prize of $50,000 with his partner, 29-year-old Natalie Casanova. As the winning team, Fossum and Casanova took home $250,000 each. “Kicking and Screaming” was a reality game show series that paired 10 expert survivalists with “pampered partners,” or survivalist novices in the show. Paired off in teams of two, the contestants had to work together to pass game challenges while learning the basics of roughing it in the wild. “Never underestimate the power of a Scout,” Fossum posted on his Facebook page in regards to his win on April 27, followed by live Q&A sessions with fans. Fossum, the brother of astronaut Mike Fossum, has been involved with the Boy Scouts of America since he was a child. 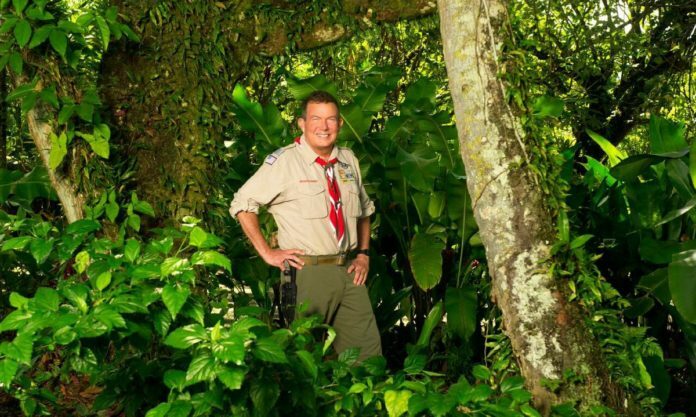 The public speaker, author and philanthropist got a casting call to join the show after a recommendation from a fellow Scoutmaster. At 52 and the oldest contestant on the show, Fossum credited the Boy Scouts of America for giving him strength to face all obstacles and ultimately win the competition. Fossum said that while he loved to go on adventures in the wilderness, “Kicking and Screaming” proved challenging because of all the high stress elements involved. Fossum said he found the experience incredibly rewarding, but the only way he’d consider doing something similar in the future would be if he could continue to keep his ethics intact. As far as giving advice to anyone interested in roughing it in the wild, Fossum says the most important survival tools involve navigation, sun protection, insulation, illumination, first aid supplies, fire, nutrition, hydration and emergency shelter. Fossum graduated from Memorial High School in 1982, the school’s first graduating class. He currently lives in Spokane Valley, Washington. As for his winnings, Fossum plans to donate some to charity and buy a piece of land in the mountains with the rest to invest in his retirement.